In the world of health and disabilities, conferences occur on a regular basis. When conference topics are relevant to our readers, we’ll bring you a summary of the discussions and the decisions or actions that result. The World Health Organization (WHO) –-the UN’s international public health agency– and the World Bank –-the international financial institution whose official goal is the reduction of poverty-– have recently estimated that more than one billion people with disabilities are not receiving adequate access to mainstream services or specialized programs, with between 110-190 million of these people encountering significant difficulties. The organizations’ plea is for governments to increase efforts to improve their response to the needs of those with a disability. Few countries have even an ‘adequate’ mechanism in place. An open forum for discussion, design and implementation of these efforts. The report positively cites many countries’ disabilities programs efforts thus far, including Uganda’s Sustainable Clubfoot Care Project, which improves detection and rehabilitation of children with clubfoot by raising public awareness that clubfoot is correctable, improves the provision of foot orthotics, trains primary health personnel, and subsidizes transport costs, and Vietnam’s pursuit to make its buildings handicap accessible, allowing children with disabilities to learn in mainstream schools, and to provide specialized support for individual students, with training for administrators, teachers and parents. Nearly 150 countries and regional organizations have signed on, committing themselves to removing barriers so that people with disabilities may participate fully in their societies. How do you feel your local community, state and country can improve accessibility? Join us at the Chicago Abilities Expo located at the Schaumburg Convention Center from July 9 – 11th. This event focuses on the latest in technology and improving the lives of people with disabilities, their families, caregivers, and health professionals. Experience new and exciting products for the disabled along with workshops, wheelchair sports, kids entertainment, and so much more. Every year is filled with new things to see. AMS Vans will be attending this year with our latest fleet of handicap vans including the AMS Long Channel Van, the Honda Odyssey, and our other side and rear entry models including the Dodge, Chrysler, and Volkswagen. 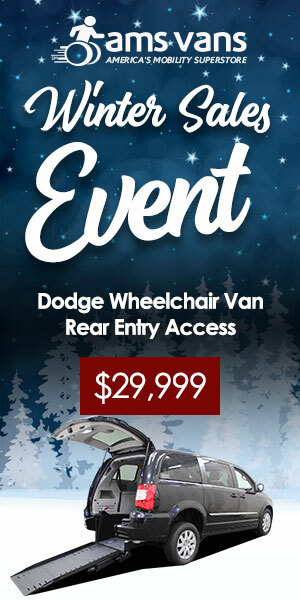 Visit us at the Chicago Abilities Expo and save up to $2000 off select vehicles in our inventory. Chances are, you know someone with a chronic, but invisible illness or disability and you may not even know it! AMS Vans traveled to Anaheim, CA May 29th through May 31st to attend the Abilities Expo. The Abilities Expo is the biggest event in the US for the disability market and gives AMS the chance to show off our line of wheelchair accessible vehicles. The Expo attracts over 6,500 attendees who come to see new products, learn about advances in technology, and attend special events and seminars. AMS Vans had the opportunity to meet with many new customers (and catch up with some of the existing AMS Vans family!) to show them our new vehicles, and discuss why AMS Vans is different than other wheelchair accessible vehicle companies. Anaheim was fantastic, and the team (Diana, Kip, Dallas, and Dennis) had a great time meeting new customers and absorbing all of the other interesting products and events. There was even an appearance by Aaron Fotheringham, who is in the Guinness Book of World Records for performing the 1st wheelchair back flip! We’ll be posting video of him on the ramp at the Expo soon, so stay tuned! The second conference that AMS Vans attended this past weekend (June 5-7th) was the Family Cafe Conference in Orlando, FL, which was held at Disney World. Diana Conte was there to talk with participants and show them the van she brought along from Atlanta. We were really excited to participate for the first year, and although attendance was a bit off, the AMS products were well received. Consumers definitely liked the idea of saving thousands on our vans! In the end, AMS Vans not only wants to sell our wheelchair accessible vans, but we really want to keep in touch with you – the disability community – and your wants and needs. We’re building a community for you on the internet (here on our blog, Facebook, Twitter, Delicious, etc), so that no matter where you might be, we can still keep in touch. We feel that the community will become a great place to find and share information to make living with a disability easier. We hope that you will become a part of our family, whether you own an AMS van yet or not. We will keep you updated with our schedule and which shows we will be attending next. Hopefully, we’ll be at the same conference soon.Â Our team would love to meet you, and you must experience our amazing vans for yourself!